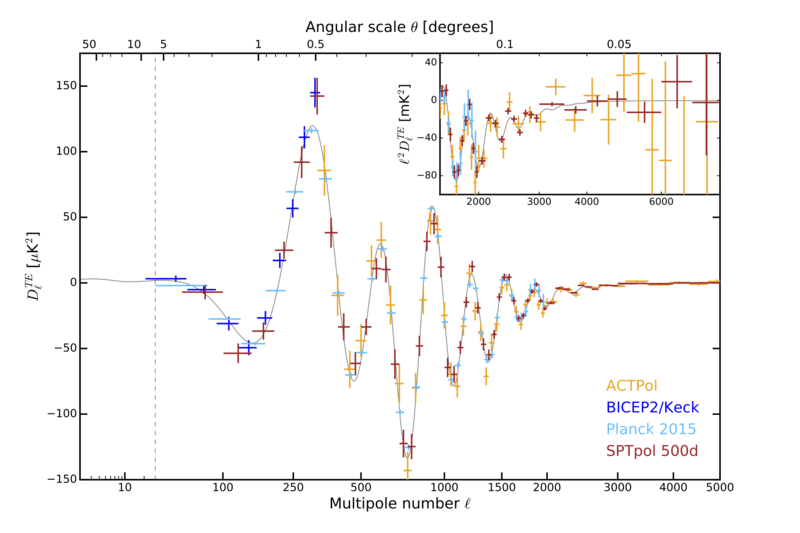 This page provides data products associated with the SPTpol measurement of the CMB EE and TE polarization power spectra over 500 square degrees described in astro-ph/1707.09353, Henning et al., 2017. 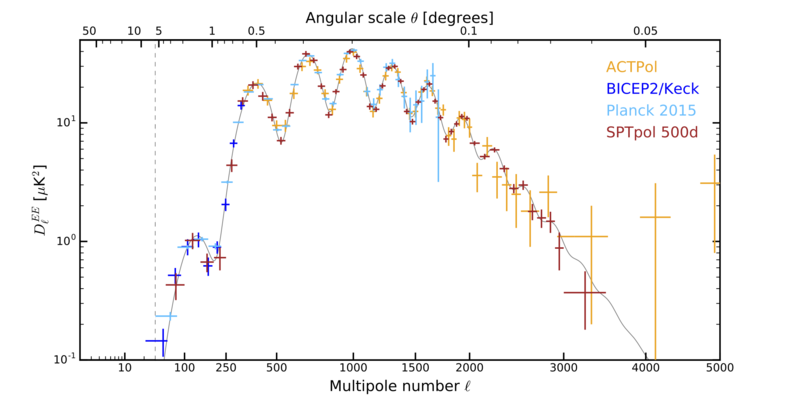 The power spectra are presented over the multipole range 50 < ell <= 8000 and can be used to constrain cosmological models using the likelihood package provided below. If you have any questions regarding this data set or its use, please contact Jason Henning (jhenning_at_kicp_dot_uchicago_dot_edu). Individual figures are available in PDF format here or bundled in a ZIP file here. We highlight some figures below. We provide the SPTpol 150 GHz TT, EE, and TE Bandpowers from observations between April 30, 2013 and October 26, 2015. The bandpowers cover the multipole range 50 < ell <= 8000 in bins of delta_ell = 50 between 51 < ell < 2000, delta_ell = 100 from 2001 < ell <= 3000, and delta_ell = 500 from 3001 < ell <= 8000. Bandcenters, bandpowers, and bandpower errors for plotting are provided in a text file here. Bandpowers and uncertainties are given in D_ell units of uK^2. Each row is one ell-bin. The columns are (1) ell_min, (2) ell_max, (3) TT ell_center, (4) TT, (5) sigma_TT, (3) EE ell_center, (4) EE, (5) sigma_EE, (3) TE ell_center, (4) TE, and (5) sigma_TE. Note that these bandpowers include power from foregrounds, such as Galactic dust and point sources, though we do not significantly detect this power. Foreground terms are included in our likelihood model and priors for them may be adjusted by editing the accompanying SPTpol batch file provided in the likelihood package below. We provide files in a gzipped tarball here that can be added to the Nov16 version of CosmoMC to interface with the SPTpol EE and TE bandpowers discussed above. These files include the SPTpol likelihood, SPTpol data (bandpowers, covariance matrix, bandpower window functions, and beam error eigenvectors), batch file, and a README with instructions for how to compile CosmoMC with the SPTpol likelihood. If you have any questions regarding the use of this likelihood, please contact Jason Henning (jhenning_at_kicp_dot_uchicago_dot_edu) or Christian Reichardt (christian_dot_reichardt_at_unimelb_dot_edu_dot_au). v1.0: July 30, 2017 - Initial version released with arXiv submission. v1.1: August 10, 2017 - LnLike now returns with covariance determinant term removed so that chi^2 = -2LnLike. Also fixed small typo in Pcal prior (results unaffected). v1.2: October 31, 2017 - Added datasets for low-ell and high-ell data splits. v1.3: July 20, 2018 - Fixes scaling problem in TExEE covariance block when fitting only EE or only TE bandpowers. (July 20, 2018): We address a bug in the likelihood (corrected in version 1.3) that incorrectly scales the TExEE bandpower covariance block when fitting TE-only or EE-only bandpowers. 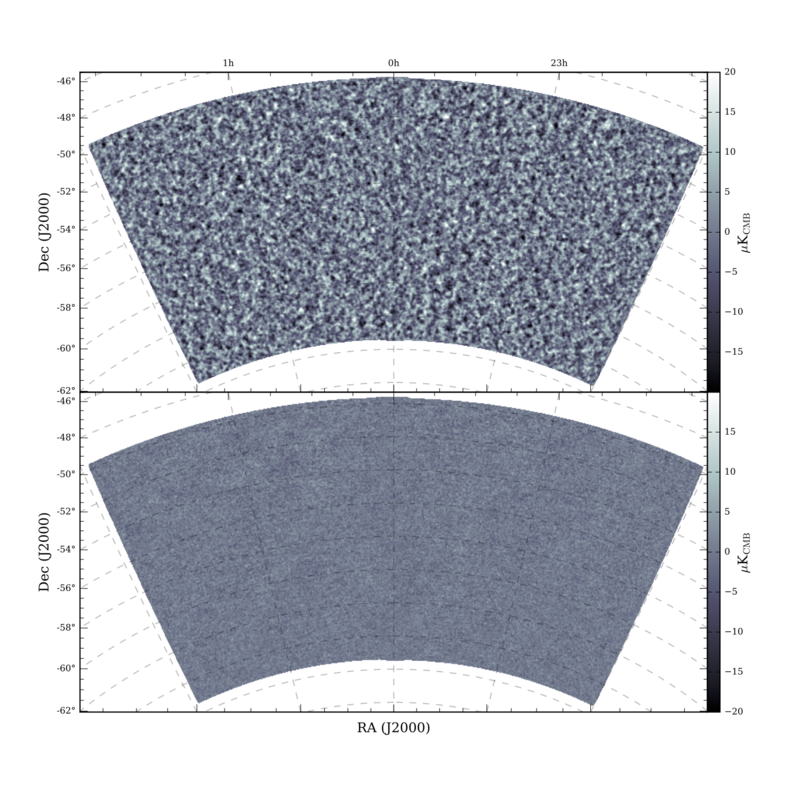 This has a relatively small impact on best-fit cosmological parameter values, but reduces chi-squared and improves probabilities to exceed (PTEs), increasing the quality of the fits. This bug does not impact fits using the combined TE+EE dataset. For each range of multipoles considered, (full = 50 < ell < 8000, low = 50 < ell < 1000, high = 1000 < ell < 8000), we provide the PTEs comparing the bandpowers to the best-fit LCDM model pre- and post-bug fix, as well as the difference in chi-squared caused by fixing the TExEE covariance scaling.